Everyone loves a beautiful, bright smile! If your pearly whites are distinctly yellowed, your confidence takes a nose dive and hiding your smile becomes an unattractive habit. Stained teeth not only hurt your self-esteem, research shows a ghastly grill can also affect you professionally and romantically. Studies have indicated that people with whiter smiles were 58% more likely to land a new job and 54% more likely to get a date. While professional dental treatments typically offer the best whitening results, they can be expensive. Even over-the-counter whiteners can get pricey and often include unappealing side effects. A brighter smile, however, can still be within your reach, with some unique, at-home remedies. DIY teeth whitening treatments immediately bring to mind baking soda. It’s one of the simplest, most natural stain fighter you’ll find and been used for decades for numerous purposes, including brighter smiles. While it’s a common ingredient in store-bought toothpastes, you can mix up your own, low-cost version at home. Mix one tablespoon of baking soda with two tablespoons of either water, hydrogen peroxide, lemon juice or apple cider vinegar into a non-gritty paste. Brush teeth with mixture, then leave on about a minute before rinsing thoroughly. Only use this whitening method a couple times a week, because the abrasive nature of baking soda can wear away tooth enamel and irritate gums when used too frequently. Not the stuff you use for grilling food! Activated charcoal is a reheated, oxidized version of backyard BBQ briquettes, but IT isn’t poisonous. You use activated charcoal in a powder form, which can be messy and stain porous surfaces. Mix powder into a paste with water, but just dab it on your teeth, instead of brushing. Wait about three minutes, then rinse thoroughly. Like baking soda, it’s abrasive, so limit teeth whitening with activated charcoal to once or twice per week. If you love bananas, then you’ll love this weird whitening solution. Instead of OTC whitening strips, cut a small rectangle from the peel of a perfectly ripe banana (one that’s not green, but doesn’t have any brown spots). Rub the peel over your teeth for a couple of minutes once a week, then brush like normal. The potassium, manganese and magnesium in banana peels help remove tooth-stains, and you can enjoy a healthy snack after you’re done. A trending technique for both a brighter smile and fresher breath is coconut oil pulling. Used like a mouthwash, swish a tablespoon of cold-pressed coconut oil in your mouth each morning for about five minutes and the antibacterial qualities may reduce gingivitis-causing plaque that can dull your smile’s wattage. One potential drawback to your hectic morning routine is studies that specify an unrealistically long 20-minute swish requirement for best results. Known for its many health benefits, apple cider vinegar’s antibacterial properties may also whiten your teeth when used as a mouthwash or mixed into a paste with baking soda. As a mouthwash, dilute one-part vinegar with two-parts water each morning prior to brushing. It may take a while to get used to the taste, but it should become more palatable over time. It may seem counterproductive to whiten teeth with something that leaves yellow stains, but turmeric can remove the yellow from your choppers. Turmeric root has long been used in cooking, but its astringent and abrasive properties are also great for tightening gums and preventing plaque. Mixing turmeric and water into a paste has similar brightening results as baking soda, but if you can’t stand the taste, try adding peppermint oil to the mix. Not only are apples and other crunchy fruits and vegetables a healthy snack, they actually act as a toothbrush and bacteria destroyer in your mouth. Crunching fruit can scrub away surface stains and produce extra saliva to help wash away stain-causing bacteria and plaque. 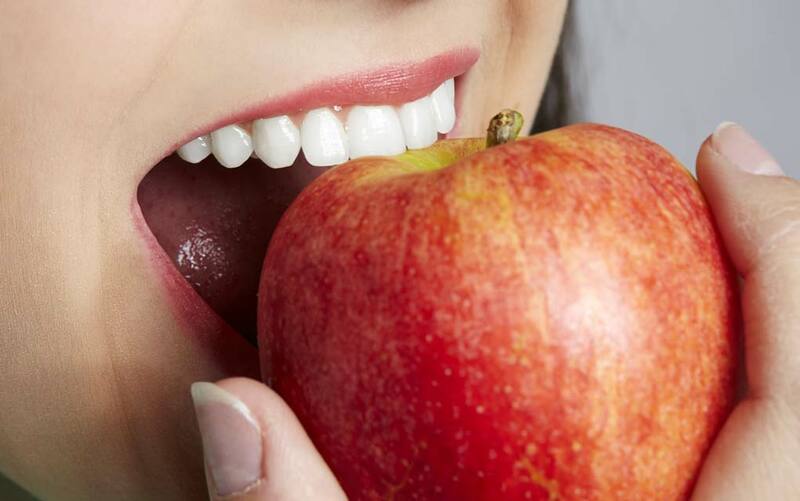 Plus, apples contain a high dose of malic acid, an ingredient often found in teeth whitening products. While the best defenses for a bright, healthy smile are regular visits to your dentist and proper, daily oral hygiene, these “good for you” do-it-yourself techniques can help produce whiter smiles.